Alpacas have adapted well to South African conditions and herds are growing steadily. Some breeders, who are not necessarily into breeding for fleece only, but rather concentrate on the quality in their herds, take the advantage of selling their neutered male stock to sheep farmers around the country. It was found, internationally, that alpacas make excellent sheep guards! The alpaca is extensively and successfully used to curb predator problems. Alpacas have a natural affinity to bond with sheep, the males being natural protectors. They graze the same pastures as sheep; their parasites are similar to sheeps’, which makes prophelactic treatment easier. They stand their ground when an intruder approaches – resorting to spitting, kicking / stomping and ultimatly giving off high-pitched shreaking noises, to chase the intruder away. They stand their ground firmly. Looking at the cost factor, a properly trained Anatolian shepherd dog would cost about R2 500.00; at the current rate, an alpaca herd guard would cost you between R6 000.00 and R7 500.00. The added bonus of saving feed, having the use of the valuable fleece and a permanent, on-site herd guard comes into the equation. They even get shorn at the same time. It was found that the loss of sheep, especially new born lambs, decreased by up to 60% when Alpacas guard ‘their’ herd. Another benefit is, that alpacas do not damage the pasture – their feet are soft padded. As alpacas are herd animals, it is not recommended to only have one animal guard a herd, but rather have a minimum of two or more. It is said that one alpaca will be able to guard as many as 150 sheep. Alpacas are social herd animals that live in family groups consisting of a territorial alpha male, females and their young. They are gentle, inquisitive, intelligent and observant. As they are a prey animal, they are cautious and nervous if they feel threatened. They like having their own space and may not like an unfamiliar alpaca or human getting close, especially from behind. They warn the herd about intruders by making sharp, noisy inhalations that sound like a high pitch burro bray. The Alpaca may attack smaller predators with its front feet, and can spit and kick. Due to the soft pads on their feet, the impact of a kick is not as dangerous as that of a hoofed animal, yet it still can give quite a bruise, and the pointed nails can inflict cuts. 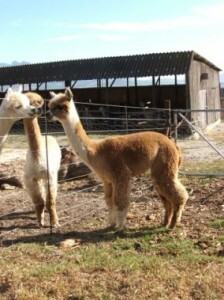 Visit SA Alpaca for available stock.